Last week, I strolled through the Rue de la Paix, a small street connecting the Place Vendôme and the Opéra National de Paris. In No 22 you find 'Repetto', a true haven for lovers of ballet flats. It was there when Rose Repetto started to make her famous half pointed ballet dancing shoes in 1947, supplying the dancers of the nearby opera house. A few years later, she invented the ballet flat (ballerina). They became almost instantly famous, and are adored to this day, for their simple elegance and chic. 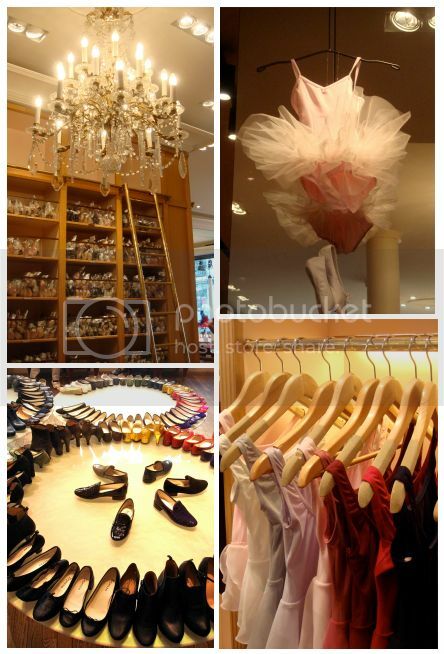 The boutique is lit by crystal chandeliers, and it's walls are covered with high shelves full of pointed ballet shoes, tutus and all sorts of ballet supplies. The collection of ballet flats is fanned out on low round tables, resembling the circle shape of a tutu. Each collection is limited, and each shoe is made in the traditional way (outside stitching and return technique) and finished off by hand. I fell in love with this gorgeous pair, a wonderful mix of floral and animal print. Love the packaging too, so pretty and adorable! I don't know what to say first - I've missed you - congratulations on your scarf ring collection - a happy start of another season - and as always, many 'wows' and thank you's for the most joyous and beautiful posts! So many things have kept me from coming here to express my admirations for my very favorite blog! All of your posts of the past month and a half are just nothing short of extraordinary. Each post is a favorite, including today's - what an incredible store and gorgeous flats you've selected - they will be a perfect accompaniment to so many of your gorgeous outfits. I went to the store earlier in the year and was in awe. 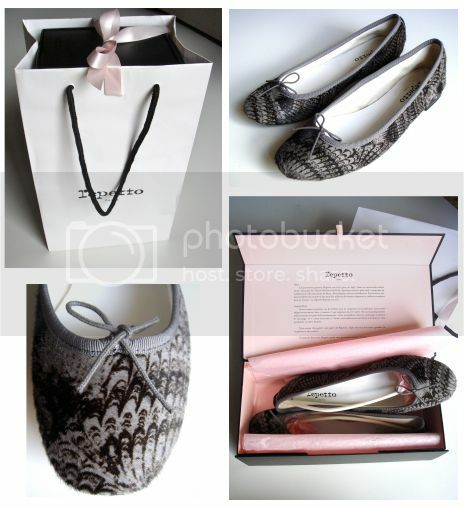 I'm a huge fan of Repetto and have worn their ballet flats in different colors and styles for years. I wish we get the same variety here in the UK. Sigh, I love Repettos and wish we got a larger variety here in the States--especially in the Camille. Congrats on a beautiful choice. I hope your week is winding down toward a lovely weekend Dear MT. I couldn't believe what I was seeing when I checked your blog this moring. I ordered the same Repetto feather print ballets from Bergdorf's here in the US three days ago. I just couldn't resist them, (but I do hope I ordered the right size.) I wanted them in brown and beige too and had to restrain myself! I'm definitely adding Repetto to the Paris shopping list thanks to you and your marvellous blog. I had a big smile on my face when I read your post today. 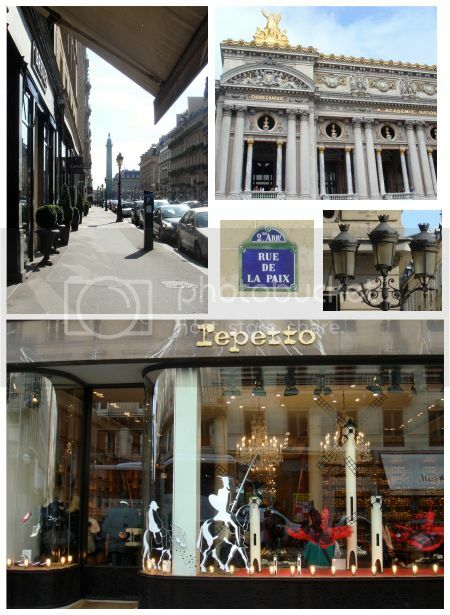 I was at Repetto, in rue de la Paix, in the beginning of August. It is a beautiful shop! I endend up bying a pair of blue ballerinas at the other Repetto shop on 51, rue du Four. Your ballerinas are so pretty and your post today a delight!!! Thank you. Warm regards, M.
Can't wait so see more posts from you. Lovely new shoes MaiTai they are really lovely and so you - enjoy! OMG! These ballet flats are another impeccable choice from the Queen of Chic. I am going to try to track down a pair. Thanks Jerrine for the leg work! I just adore the texture of this little jewel! I am curious to know how they run in size since I am between sizes. I loved your description of the shop and displays....a happy reminder of childhood days spent in tutus and ballet shoes. Dear MT, thanks for showing us your lovely shoes. I'm in love with that pattern and found a store in Seattle that carries this brand. Do you mind sharing the name of your shoe ? Do they run true to their size ? Thanks !! Mai Tai, would you mind informing us about their prices? Is there a wide range, for example? Thank you ladies for your lovely compliments re my new shoes, you are all so sweet to say so! Comfy like slippers, and light as a plume, dear dogbiskit! Thank you for sharing your precious memories, dear Maisie, so happy this post evoked them. Went to check your blog asap, dear FF, and the très Kelly is très chic indeed! Woohoo re a new H boutique coming near you, how exciting! Since the TK is from this current season, they should have a good stock of it, and btw, it comes with a fuchsia border too! Here’s to Repetto, dear Chocolate, Cookies and Candies! How fun to have crossed paths, albeit a few months apart! Hi A, they were 265 EUR, I remember thinking that it’s very nearly the price of a 90 Carré! Hugs from one Repetto lover to another, dear SMR. Which one is the Camille? Hope you can come over one day, and get a pair in every colour! Have a wonderful weekend too. What a great coincidence, my dear Jerrine, and how wonderful to be shoe twins with you! I did not see a brown/beige version, thank God! I don’t think I could have resisted it. Thank you also for reminding me that they are called feather print, I completely forgot. Size wise, I am a 38 1/2 to 39, and had to take a 39 1/2. So it’s just a teeny tiny bit more than half a size up. How wonderful that we too crossed paths there, dear Manuela, this is so much fun!! One day I hope we will cross paths at the SAME time.. Congrats on your blue pair, I can imagine how pretty they must be! Thank you, dear Butterfly, and happy you enjoyed the post! 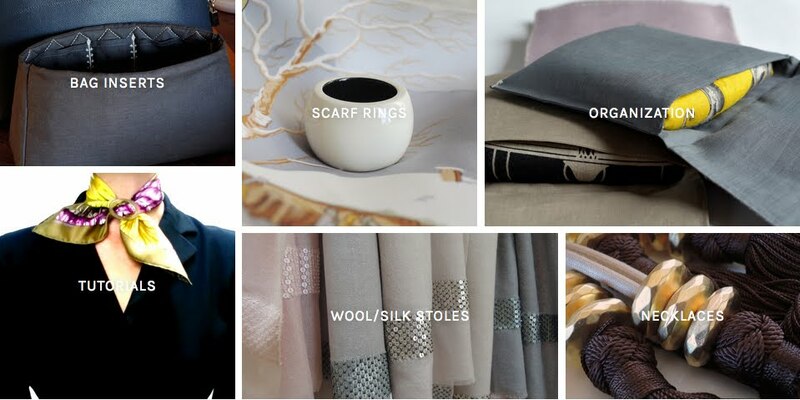 Hope you’ll enjoy a browse in the Rue de la Paix boutique one day soon!! Thank you, dear Scarf Addict. With your passion for ballet, I thought you’d might enjoy the post! Thank you, my dear Trudye! Cheers to shared childhood memories, the boutique truly is so evocative.. Among the customers were some adorable mother/daughter pairs, shopping together for tutus, pointed shoes and ballet flats. The texture of the feather print shoe is pony hair, which makes it so soft and beautiful. Re the size, see my reply to dear Jerrine! Chkpfbeliever, I forgot to ask for the name of the model, but thanks to our Jerrine we know it’s called feather print! Apparently it comes in brown/beige too, drool! Good luck, my dear!! The pattern of the shoes actually looks like marbling-the technique where you use paint on water and transfer onto paper/material. You often find it on the end pages of old books. I thought I'd comment as you did not seem to know what the pattern is. So glad you commented, and many thanks for sharing your knowledge about the pattern. I kept looking at the print, as it seemed so familiar to me, but I did not 'see'. Years ago, I bought marbled notebooks in Venice, et voilà, I now have the shoes to match. Many thanks again, and congrats on scoring three Repetto pairs at the summer sale! The Camille has a higher heel, but not as many yummy colors and patterns as the BB flat. I also hope we cross paths one day in Paris. Have a lovely weekend! Thank you for the info on the Camille, dear SMR, I will definitely look out for it the next time! Now I have yet another reason to visit Paris. I love ballet flats! The ones you chose for yourself are stunning and quite special. I can't wait to see you modeling them. Many thanks, dear xandrah, so happy to hear you like my new shoes! The boutique is truly a special place to visit, and buying your ballet flats from there, is as if they come with a little bit of Paris' history attached. They certainly will have memories attached from your trip, and I hope you can make it one day soon! Although I've been too busy for words, I've breezed through your blog regularly. But now I HAVE to comment, because as you can imagine I have quite a Repetto collection... Unforgotten, my first visit to the Paris store a few decades ago: Madame, lioness-like ruling the sales staff - everyone terrified yet, like me, balletically ecstatic! Genial dispatch and this post helped me alot in my college assignement. Gratefulness you as your information.